For us as nature geeks, a citytrip is best combined with a trip to its surroundings. A perfect city-nature combi is a trip to Lisbon. Visit Lisbon for a day or two, then rent a car and drive west towards the Atlantic Ocean! 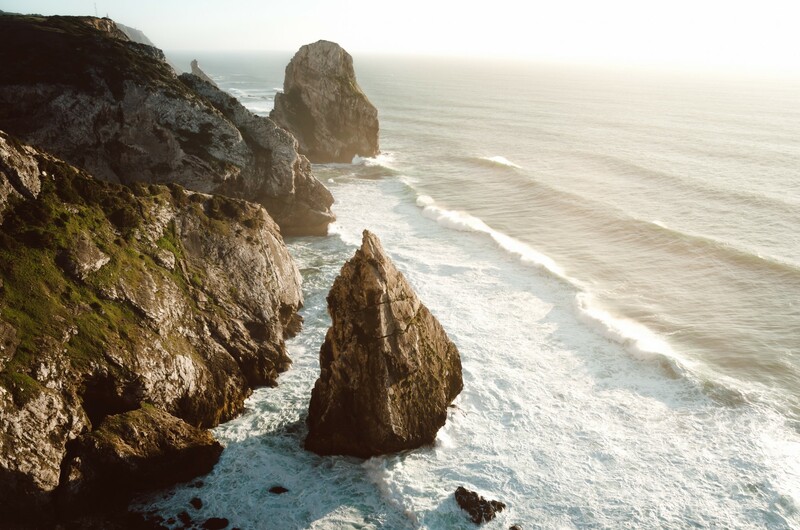 In Parque Natural de Sintra-Cascais you will find stunning cliffs, beautiful waves and small beaches. It is great to hike along the coast or to romantically watch the sunset on a cliff. The car ride from Lisbon takes about 40-50 minutes. I would recommend to drive two different roads when you go and when you leave. There is one road next to the coast from where you can visit many beaches and cliffs. 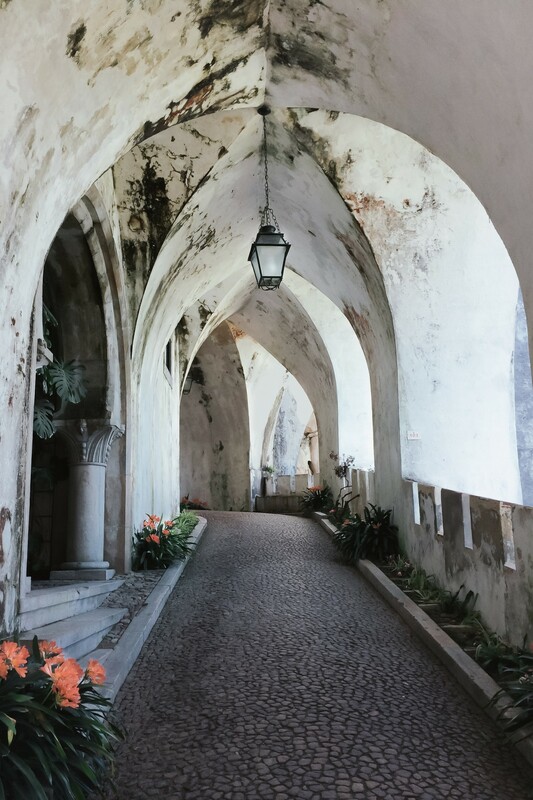 The other road goes through Sintra where you will pass some colorful and typical palaces worth for a visit! We have listed some places near the coastline you should visit when you are in or near Lisbon. Cascais is a coastal town 30 kilometers west of Lisbon. 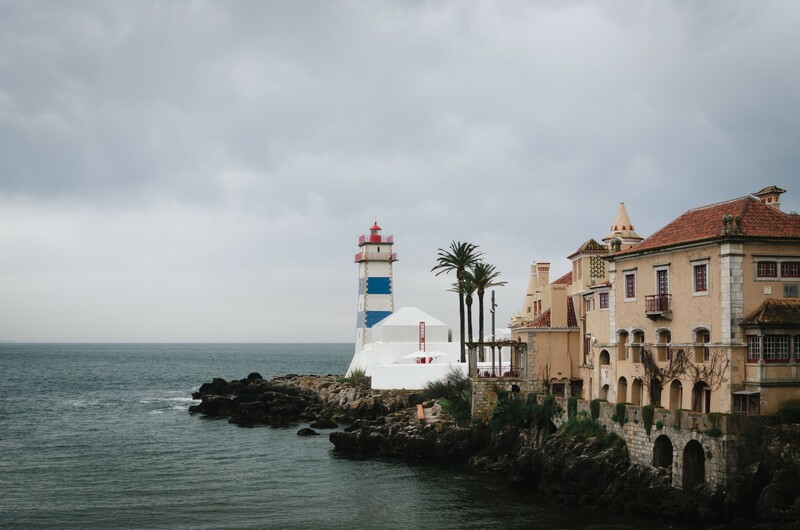 Cascais has its own blue-white striped lighthouse and charming streets. It is the starting point of Parque Natural de Sintra-Cascais. Cascais is a good place to eat after a day full of hiking! Boca do Inferno is a cliff formation close to Cascais. 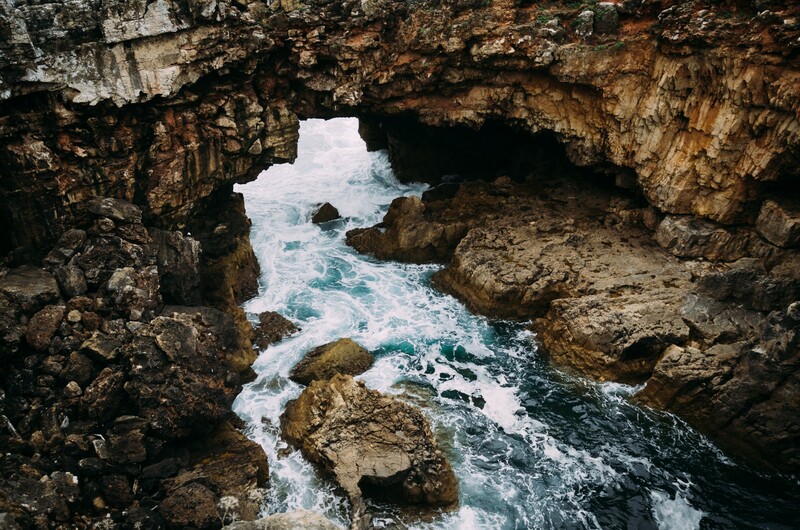 The waves of the Atlantic Ocean carved out a small cave. This cave collapsed resulting in this small bay and arch. You can climb the cliff and view the arch from both sides. 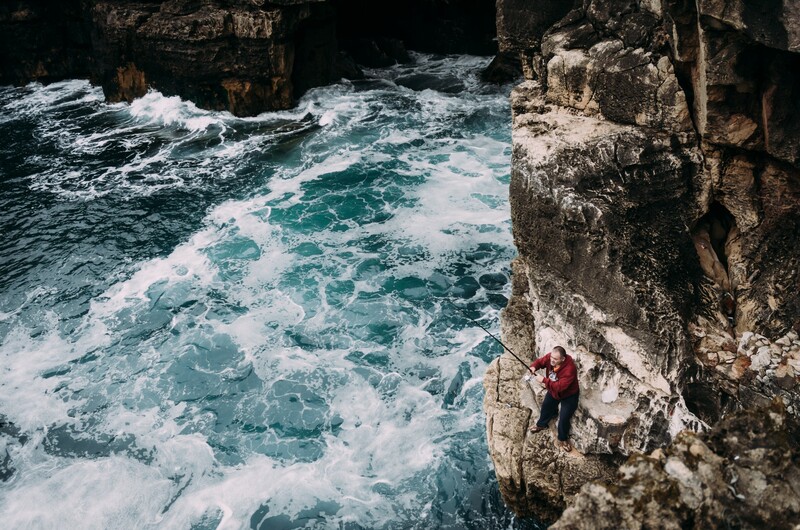 It is not uncommon to see fishermen on the cliffs. The name is translated to ‘Hell’s Mouth’. This is because in the winter when there are storms the ocean is going through the arch into the bay with strong splashes. This beach is popular among surfers. This beach is relatively large compared to Praia da Adraga and Praia da Ursa and is free of rock formations. The beach appears in the James Bond movie On her Majesty’s Secret Service. There are no spectacular cliffs but the golden color of the sand and the surfers make the place worth a visit. When it is hot this is a good place to go sunbathing. Cabo da Roca is the most western point of Portugal and continental Europe. At this point you have a beautiful view of vertical cliffs with a lighthouse on top of it! You can get a certificate here that you have been on the most western point of continental Europe. Praia da Ursa is a small but beautiful beach. It is difficult to reach because of the steep and curvy path down to the beach. During our walk to the beach we were unfortunately unprepared without proper hiking boots so we turned around once we arrived at the difficult parts. It was a big mistake not to put on hiking boots! However, I recommend you to visit this place when you are around! You can find hiking directions of more easy and difficult roads to the beach here. Praia da Adraga was my favorite spot during our trip to Portugal. You’ll find a small beach in between cliffs. It has a stunning scenery of rocks combined with golden sand. 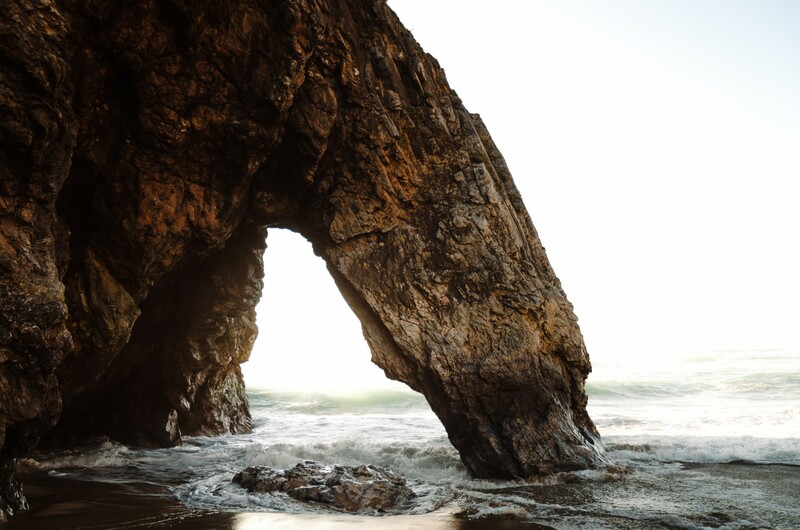 On the left side of the beach you’ll see an arch. Many people see a bear drinking water in the rock formation. You can check it yourself on the foto below this paragraph. What do you see? On the right side there are different rocks on which you can climb, sit and watch the waves rolling by. We decided to climb up the cliff during the sunset. If you arrive up the cliff you’ll have an amazing view of different rock formations. You can see the rock formation of Praia d’Ursa. Behind this you can spot the lighthouse of the most western point, Cabo da Roca. We brought some food and had a picknick on this cliff with a breathtaking view. In order to get here walk up the unpaved road just a couple hundred meters from the beach (see the map below for the starting point). Just keep following the road until you reach the edge of the cliff. Praia da Adraga is about 18km North of Cascais. There is no public transport to this beach. You can park your car next to the beach at a small car park. More land inwards you’ll find different palaces. You can visit the Castelo dos Mouros, an old castle built in the 8th and 9th centuries. There is the Palácio and Quinta da Regaleira, a 19th century palace. Next to there is Palacio da Pena, build on top of a hill. It is an amazing and colorful 19th century palace. From the outside the palace has bright red and yellow colors. Because of these crazy colors it is definitely worth a visit! Moreover, there is a big garden of Queen D. Maria II where you can walk through. You’ll have to pay a fee to enter these palaces. Next to the places we’ve just listed there is more that Parque Natural de Sintra-Cascais has to offer. We recommend just to drive/hike in the surroundings and you’ll find beautiful places. You can spot Azhenzas do Mar, a small town situated on a cliff and cabo raso an area with redcoloured rocks. We recommend to visit this part of Portugal outside the peak seasons because especially the beaches are best when few people are around. We really enjoyed our stay at Casal Santa Virginia. This hotel is situated on a cliff. The hotel is run by a sweet old Portugese lady who makes pancakes with fresh fruit for breakfast! 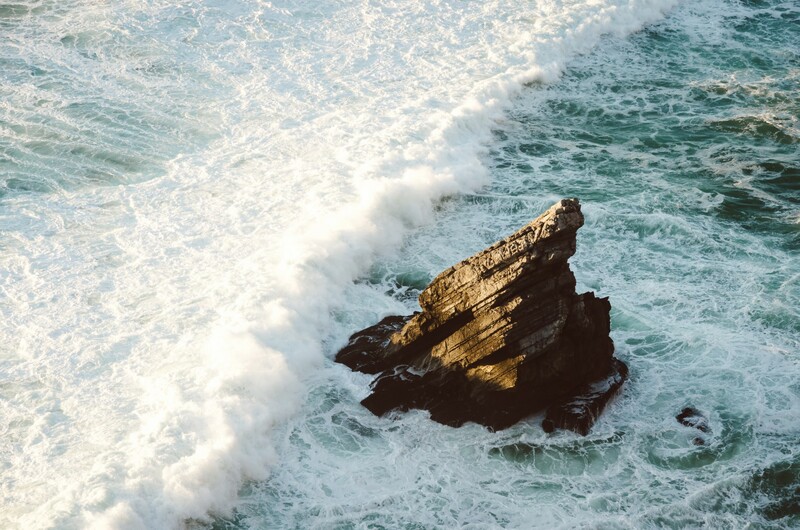 Book a room with an ocean view and you will wake up hearing the waves and eat breakfast while watching the Atlantic ocean! You can find their website here. Great article talking about Cascais and Sintra. Keep up the excellent articles written . Thank you! That is very good to hear! Dat ziet er heel gaaf uit! Toevallig ware we een paar weken terug ook in Lissabon en omgeving, maar we logeerden net iets noordelijker en hebben het strand bij Lissabon zelf dus niet gezien. Mooie plaatjes hoor. Nogmaals Dankjewel! Ik ben je website al aan het bekijken voor foto’s van Portugal!